Northcountry Cooperative Foundation is a 501(c)3 nonprofit organization founded in 1999 in Minneapolis, Minnesota. Our mission is to “transform lives and communities through cooperative enterprise.” We carry out this mission by providing technical assistance and cooperative education to cooperative organizations. From our inception, we have been innovative and entrepreneurial, seeking out creative, socially organized approaches to challenging problems. We act on our mission primarily by helping residents of manufactured housing communities organize cooperatives, carry out a shared purchase of the land beneath their homes, and support them in the governance, oversight, and completion of infrastructure and other special projects in their resident-owned communities. As one of several cooperative development centers around the country, we also deliver ongoing education, organizational development, and support for worker cooperatives, youth cooperatives, and food cooperatives. Our service area consists of five states in the Upper Midwest: Minnesota, Wisconsin, Iowa, North Dakota, and South Dakota. Since 2002, we have focused on resident ownership in manufactured home communities. Our work is modeled after a successful thirty-year-old initiative in New Hampshire, which in May 2008 was organized into a national social enterprise called ROC USA™. The NCF Board, in Fall 2014, adopted our new five-year strategic plan from 2015-2019. The plan builds upon our organization’s strong and pioneering work while creating a framework to pursue new opportunities consistent with our mission of “transforming lives and communities through cooperative enterprise”. Click here to download our current strategic plan. ROC USA Network map. Yellow dots represent resident-owned communities. NCF is one of nine Certified Technical Assistance Providers (CTAPs) through ROC USA. ROC USA is an organization dedicated to making “quality resident ownership viable nationwide.” ROC USA delivers on this mission primarily through the work of ROC USA Network, which provides peer-to-peer networking for the CTAPs it supports, and through ready, competitively priced financing for acquisition and capital improvements from ROC USA Capital™. NCF serves Minnesota, Wisconsin, Iowa, North Dakota, and South Dakota. NCF is a Lead Organization Member of the I'M HOME Network. 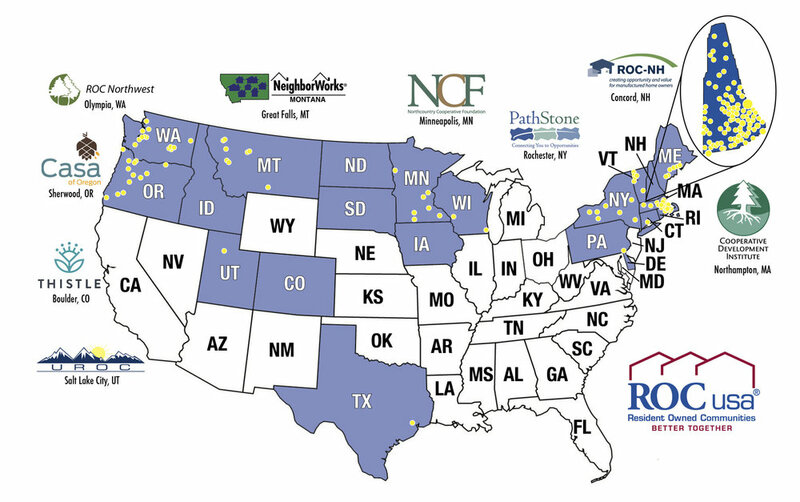 I'M HOME is as an initiative coordinated by Prosperity Now (formerly CFED) and is designed to empower, inform, and connect cross-sector partners in the development and growth of the manufactured housing industry. As a Leading Member, NCF is part of a core group of organizations from across the country who have demonstrated commitment to and experience developing manufactured housing solutions that build financial security for homeowners. Learn more about the I'M HOME Network. Ryan Allen is an associate professor of community and economic development in the urban and regional planning area. His research focuses on the community and economic development processes of immigrants in the United States. Recently, he has focused on how households have responded to the foreclosure crisis as well as how the foreclosure crisis has affected neighborhood quality in the U.S. He is also interested in immigrant home ownership and entrepreneurship. His practical research approach to these topics draws upon the strengths of multiple disciplines, including sociology, economics, and political science, and takes advantage of quantitative and qualitative research methods. Jim is an affordable housing development professional and recognized leader in the nonprofit sector. Jim has over thirty years of diverse planning, administration, management, evaluation and policy development experience in the areas of housing, community development, and workforce development programs. Sarah is Program Officer at Family Housing Fund. She has more than a decade of leadership experience in affordable housing and community development finance at national and regional nonprofit social enterprises, in strategy, innovation, development, and management roles. Berke’s experience and interests include affordable housing preservation and development, access to financial capital, networked social enterprise models, and international exchange. She has an MPP from the Humphrey School at the University of Minnesota, a BA from St Olaf College, and is an alumna of the Fulbright program in Russia. Joelyn’s career focus has been on financing and service delivery for health care and human services, especially integration of long term care and acute and primary medical care for the elderly and people with disabilities. Her interests include affordable housing, which is a particular concern for these individuals. She previously worked for Disability Services Division, Minnesota Department of Human Services. Jennifer currently works as an engagement strategist at Zeus Jones. She has worked in the for profit and nonprofit sectors, including two years of fundraising experience, one year of advocacy experience, and ten years of advertising agency experience working with local and national clients, including Target, Citibank, 3M, and Nestle. A resident of Northeast Minneapolis for over a decade, she is very active in the local community. Past volunteer work includes Board Member of the Audubon Neighborhood Association, Chair of its Neighborhood Revitalization Program committee, and ESL Tutor. Jennifer has a Bachelors Degree in Marketing from DePaul University and an MPA from the Humphrey School at the University of Minnesota. Pat currently serves as the Vice President of the Park Plaza Cooperative Board of Directors, a resident-owned manufactured housing cooperative where she lives. She has a background in sales support for several major US corporations and currently works in sales at Home Depot. Dave is the leader of the cooperative law practice group at Dorsey and Whitney. Swanson has more than 20 years of experience providing legal counsel to cooperatives, dealing in formation, acquisitions, financing and board governance issues.